THE first machine in this country to be designed around a tricycle type of undercarriage, the Arpin pusher, is a type which is now in process of development. Safety and comfort have ДальшеMore>>> been the two points for which the designer has striven. By placing the engine behind, an almost perfect field of useful view has been provided for the occupants, and the controls have been arranged so that it is almost impossible for the pilot to get into difficulties. 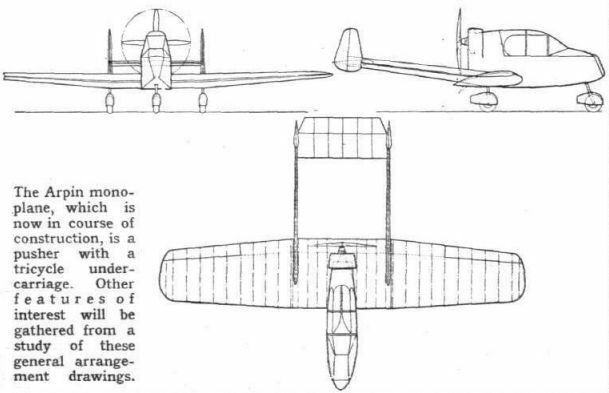 Generally speaking, the layout is somewhat similar to that of the Stearman-Hammond, which was described in last week's issue, the specification including twin fins and rudders supported on tailbooms, and a split flap, which extends unbroken from aileron to aileron. The engine to be fitted is a British Salmson of 68 b.h.p. M. B. Arpin and Co., Longford, West Drayton, Middlesex. The Arpin Two-seat Light Cabin Monoplane (68 h.p. Salmson engine). The Arpin A-1 at Hanworth shortly after completion in May 1938, showing the roomy two-seat cabin. The A-1 in 1939 with a 90 h.p. Blackburn Cirrus Minor I, re-positioned pitot head, new nose and static mass balances on rudders and ailerons. The Arpin monoplane, which is now in course of construction, is a pusher with a tricycle undercarriage. Other features of interest will be gathered from a study of these general arrangement drawings.